One of mtn cheapest data plan is the MTN night bundle for browsing from 12am to 5am everyday for as low as 25 Naira and 50 Naira. MTN weekend data plan bundle is only available on weekends (Saturdays and Sundays). All of the data plans listed here works on android and iPhone. So choose any cheap data plan of your choice. Enjoy chatting on WhatsApp, tweets on Twitter, and other social app like Facebook, Instagram and Snapchat for as low as 25 Naira. To check data on MTN dail *131# and follow the on-screen instructions to see your MTN data balance. The mtn cheapest data plan available. 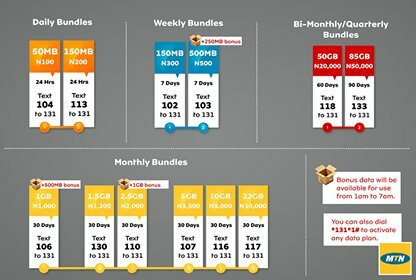 More updates on data cheap data plan for MTN, glo Airtel and Etisalat will be made available.